Have you ever wondered who controls the aircrafts and who directs them for proper landing? Do you think controlling air traffic is simple? Remember, there is no 2nd chance here. You just can't let them crash! 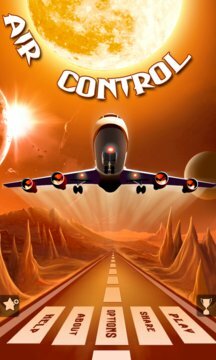 Play this addictive and adrenaline pumping game of controlling the air traffic. In this surprisingly addictive game you take on the role of an Air Traffic Controller. Your job is to direct airplanes to right runways while avoiding other aircrafts and missiles. Air traffic control is a very challenging job, but not for you. You don’t need heading angles and flight rules. You’re a born controller! ★ Sounds easy? Make a smart strategy to manage flight paths to keep the chaos under control. 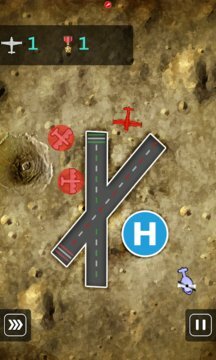 ★ Show your skills to control the heavy, light planes & helicopters and land them properly without crashing. ★ An air traffic control simulation with highly realistic radar behavior. ★ This is much like the real thing, never quite enough air space and always one too many aircrafts! ★ Land the planes and helicopters safely and make nice journey for the passengers. ★ Manage multiple aircrafts and helicopters, coming from different directions & with different speeds. ★ Varied themes make the game even more adventurous and addictive! ★ Non-stop excitement with 5 unique themes in the Game- Mars, Ice, Jungle, Night, & Ocean. ★ Fasten your seat belt and enjoy the gripping adventure. It seems the sky is going to be a bit more busy than the usual. Now it's you who needs to make sure that it is safer too. Hold your seat fast, cause this game is going to move you to the edges!